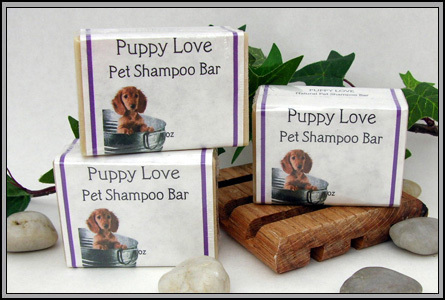 Formulated with Neem seed oil, helpful for skin conditions and insect repellant, this shampoo bar for dogs is mildly scented with essential oils that are insect repellant. Their noses are much more sensitive than ours! Should not be used on cats. Rub bar over wet coat, and work into a lather with fingertips. Avoid eye area. Rinse well. Ingredients: Olive oil, rice bran oil, coconut oil, sodium hydroxide, Neem seed oil, goats milk, castor bean oil. Essential oils include Eucalyptus, Lemon Tea Tree, Kunzea Ambigua (Australian tickbush).